Where else but Venice Beach would you find a character like this? OK, well, maybe New York City. I couldn’t resist taking this photo and truthfully, this is the one I was searching for the Weekly Challenge that I just posted. A group of us new-to-California-curious-folks decided to check out Venice Beach one Sunday afternoon. What a great day of people watching, enjoying the sun and surf, listening to the drumming, watching the graffiti artists and eating all the delightful but absolutely not-good-for-you “boardwalk” food. Then along came this guy holding his card board sign. 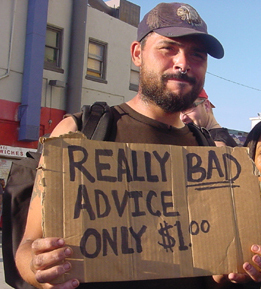 And of course, he wouldn’t let me take a picture without paying him $1.00 for some really bad advise. I would be so curious to hear what he’d have to say, if only for a chuckle and the novelty of it all 🙂 Good marketing gimmick!